_ Microcredit triggered Karaman-Germany 'wedding line' set up. We are the jury meeting of CITIBANK's "Micro Entrepreneur Awards". Iğsan Necipoğlu, President of Dow Turkey and Central Asian Republics, Belgin Aksoy Berkin, Member of the Aksoy Group, Yasemin Bulut, who won the prize last year, Hakan Güldağ, Şelale Kadak and Talat Yeşiloğluvar. - Women Labor Assessment Foundation, Maya Micro Economic Support Enterprise, Turkish Foundation for Waste Reduction, ARGE Consulting. - We received applications from 2 micro-entrepreneurs. 33 women were in the final. - I started this at home first. I wanted my daughter, who was uncomfortable, to grow up. Then I used micro credit and opened my shop. - 10 thousand pounds in 2015, 10 thousand pounds in 2016 micro-credit I have used. - Clearly successful women can climb large slices of microcredit over time. - 80 thousand in 2015, 100 thousand TRY in 2016. - I sell the wedding ceremony and wedding organization business abroad. - What countries are you sending? - Mostly Germany. However, I also have clients in the UK, Belgium and France. - Are your customers in Europe Turks? - Yeah. We started with the ones we liked from the marriages and weddings of relatives in Turkey. We also built a social network. I glanced at the results after the 3-hour jury marathon, Fadimana Dinçer was the winner in the "Vision" category. The winners of the competition are as follows: Tuğba Çetin (The Year's Micro Entrepreneur), Şilan Yazıcı (Young Micro Entrepreneur of the Year), Sahile Kaplan (Financial Success), İmmi Kuşkaya (Social Impact), Second Impression (Personal Struggle), Yasemin Açıkgöz Local (Local Role Model). If the Turkish Exporters Assembly (TIM) takes advantage of micro-entrepreneurial women to export, does not their business develop further? 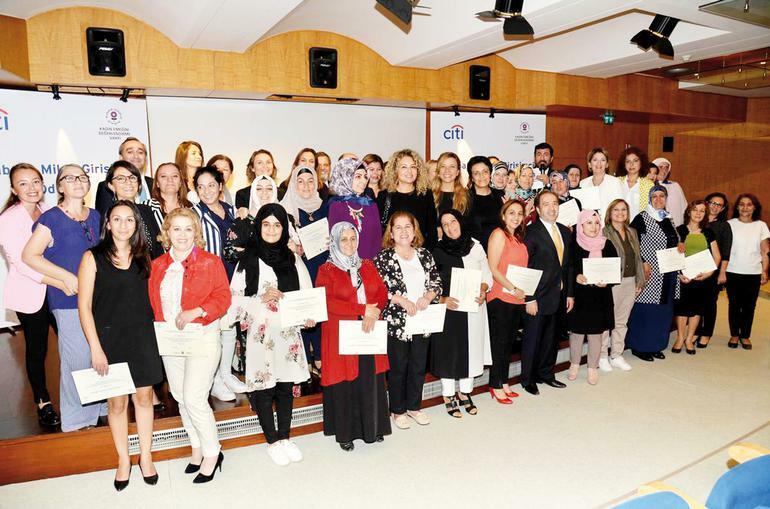 More than 18 women attended the Micro Entrepreneur Awards in 9 years. More than 250 awards were awarded. I believe that the 18 thousand entrepreneurs who gave their names wrote their names to the winners. These women are creating their own successes. Micro entrepreneurs are signing the macro success. - Microfinance services are an important tool in increasing women's entrepreneurship. Micro credit is contributing to jobs and employment, encouraging savings and empowering women. - Everyone's ability is transformed into a business life, a driving force is needed. This water is the micro-capital which is the small capital.